In food-based industries, there are many rules and regulations related to sanitation and the prevention of contamination. Maintaining compliance with these rules and regulations is imperative. It may be challenging to produce hygienic products that adhere to the exact requirements of local, federal, and international policies. If a product is contaminated during its manufacturing, it causes a severe loss of money and reputation. This is where you can use high-quality tri-clover valves to mitigate the risks and ensure perfectly hygienic working conditions. The valves and fittings used in food processing industries should be hygienic and sanitary.. It They should be smooth and polished without any cracks or crevices. In fact, you need to invest in the fittings that are non-porous, non-toxic, polished and corrosion resistant. They should be easy to clean in situ and designed to ensure smooth working during operations. What are the Risks of Contamination? The chemicals, metals, and residues in a food processing industry can lead to a system shut-down if they lack proper sanitation. It is important to maintain frequent cleaning and sanitization of equipment used in these applications. Hence, you should choose the valves that can be cleaned in place for sanitary processes. The standard tri-clamp valves are perfectly designed to serve this purpose effectively. 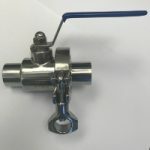 When using sanitary valves, you’ll observe that tubing and tri-clover valves can cover a large part of product contact surface. This is the contact area where it is important to maintain perfect sanitation. The quality of a valve can ensure weldability, structural strength, smooth flow, and minimized contamination. These factors are imperative for the sustainability of a system and for higher operational throughput. Here, you need to assess the quality of valve used in your process. Preferably, buy them from a trusted manufacturer paying a lot of attention to manufacturing precision and their design. They should hold certifications and accreditations proving the authenticity and quality of their products. Every product must undergo a stringent testing procedure to deliver leak-proof connections and high tolerances to the system pressures. You should find a valve that proves its worth on all these quality parameters. How to Ensure Longevity of Sanitary Valves? For safe and efficient operations of valves, it is important to make sure that they are regularly maintained.Preventive maintenance is the best method to identify problems in a system and rectify them without causing costly downtimes. If A quality tri-clover fitting can be used it for sanitary connections in any system. There should also not be any damaged components or seals in a system as they can affect the calibration of the fittings and restrict their performance. Whatever be your application requirements, tri-clover fittings are always a viable choice if you need sanitary connections. So, choose them wisely.